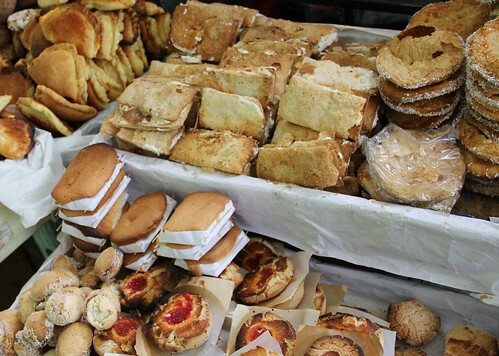 We spent a few days in La Paz, Bolivia after our awesome salt flat tour, and every day we’d walk through a market near the hotel to find the woman who made these pastries. She’d be there bright and early with fresh sugary goodness for us to try. We must have eaten dozens of these treats over the span of four days. Delicious! 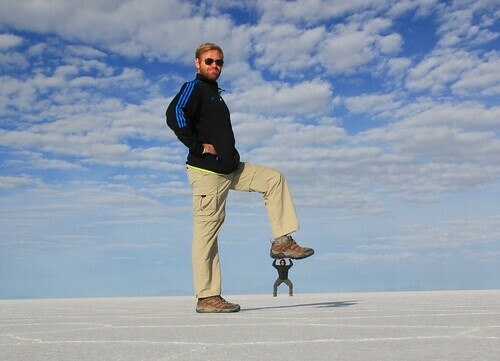 We’ve seen a lot of optical illusion type photos taken in the Salt Flats of Uyuni that come out terribly fuzzy, so we thought we’d share with you how we got ours to be relatively clear. In the photo above, Bryan looks like he is about to eat Kristin. 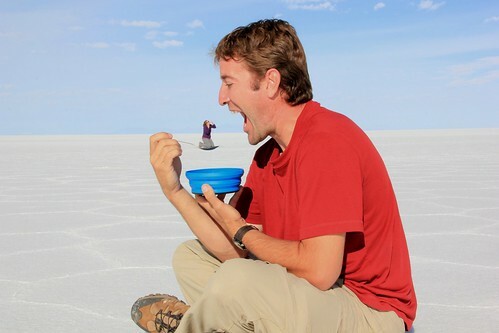 To get a shot like this Kristin had to be far enough away from Bryan to appear small enough to sit on the spoon. You can eyeball this and have the person in the background move as necessary. Whoever is taking the photo needs to be down on the ground, relative to whoever is in the foreground of the shot. From here it’s just a matter of lining them up so that she appears to be all the way on the spoon instead of just above, or below it. In some cases it’s easier for the photographer to move, in others you can adjust the subjects slightly. The real trick, however, is getting all the subject to be in focus. To accomplish this we used the manual settings on our cameras, though really you just need to be able to adjust the aperture. We set the aperture to a high number (the higher the number, the smaller the opening that lets the light in) and then let the camera set the shutter speed. In the first photo, we had the aperture at f29, with a 1/60 shutter speed. We took 8 or 10 photos, adjusting the focus slightly in each one until we were happy. Sometimes it works to focus somewhere in between the subjects, other times it works better to focus on either the front or the back subject. At this point I can’t remember what worked best in each photo, but just take loads and you’ll be sure to get at least a few that turn out. For some, like the jumping shots with the guidebook, the photographer has to get right down onto the ground in order for the effect to work correctly. Again, the key for us seemed to be getting the aperture at a high setting, with a slower shutter speed. For the jump shot we used f25 with a 1/80 shutter speed. Good luck, and don’t forget to bring some props! 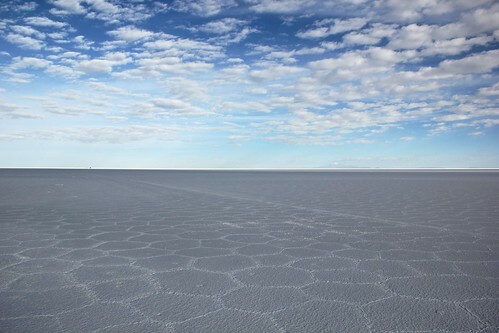 The salt flats in Bolivia seem to go on forever! 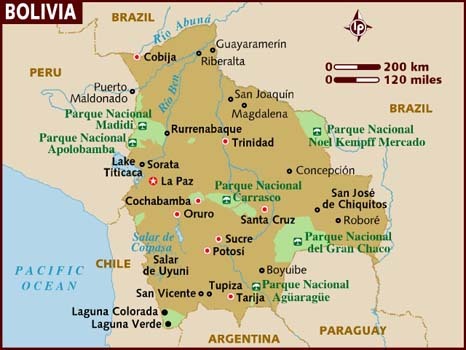 For a country that is quite small in comparison to some of its neighbors, Bolivia has a lot to offer in terms of travel possibilities. There are mountains, volcanoes, jungles, lakes and deserts, and it’s relatively easy to move from one place to another. We were intrigued by the possibilities and one of the major ‘must see’ items on our list was the famous salt flat near Uyuni. There are a myriad of ways to visit this area, but since we were making our way up from Argentina, we chose to do a 4 day jeep tour that began in Tupiza, and ended in Uyuni. We’d already been travelling with our friends Kristin and Bryan from Happy To Be Homeless and were planning on meeting up with another friend, Eric from Ric and Roll, in Tupiza. It’s easy enough to cruise into town, especially with a ready-made group of 4-5 people, and book a trip leaving within a day or two. We set out early in the morning, our packs strapped to the top of our Landcruiser, ready to see some of Bolivia’s highest lakes and desert formations. Over the next few days we drove hundreds of kilometers on roads that often weren’t really roads at all, sometimes on ledges that were terrifying, or through dry riverbeds dotted with massive rocks. We spotted small villages, huge lakes, towering volcanoes and tons of flamingos. That’s right, flamingos. 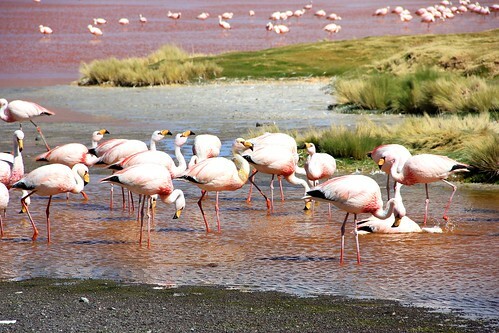 As it turns out, something about the altitude and composition of the mineral lakes (some of which are poisonous to humans) makes a perfect habitat for flamingos, of which there are thousands. It was fascinating to see the bright bursts of pink these birds provided in the otherwise stark landscapes. One stop had us soaking in a hot spring, which was especially nice after being quite cold for most of the trip. One of the most surprising sights was the huge amount of quinoa that dotted the landscape. It’s a colorful crop and farming it is one of the major sources of income for locals in this area.The other common income source is raising llamas, which were also quite abundant. Many of the animals have “pierced” ears, with different color poms that serve to identify them as they wander around the plains. 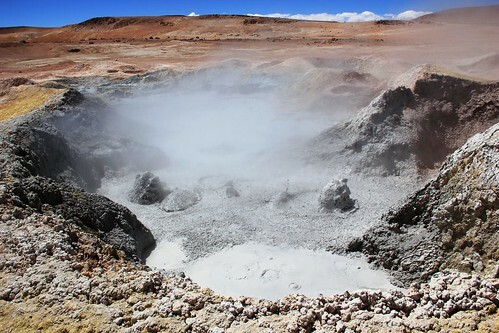 At our highest point, over 5,000 meters, there were amazing sulfurous hot mud pits that boiled and gurgled like a horrible stew. It was both terribly smelly and oddly fascinating. 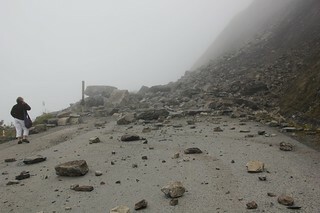 As we neared the end of the trip we wandered among huge rock formations that seemed to come out of nowhere. 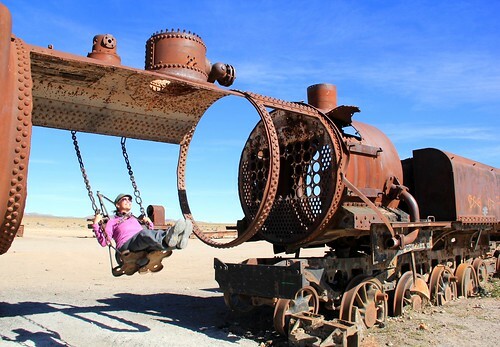 When we finally arrived in Uyuni we took some time to visit the train cemetery before tucking in for the night since we had to wake up before dawn to make it to the salt flats before sunrise. This was much more interesting than we anticipated, with all kinds of old trains abandoned and sunk into the ground. Some clever folks even created playground equipment, including see-saws and a swing, from old train parts. The salt flats were just as incredible as we had imagined, and we couldn’t have asked for a better sunrise. 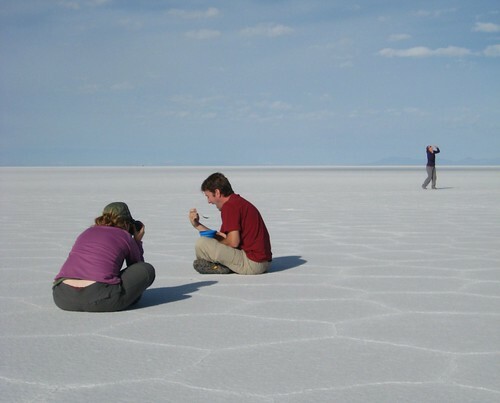 After driving far out onto the flats to have space all to ourselves, we spent hours, literally, taking fun optical illusion photos with the expansive white background. For more photos, check out the slideshow below. Click to expand it to full-screen in flickr, or to see the individual photos. 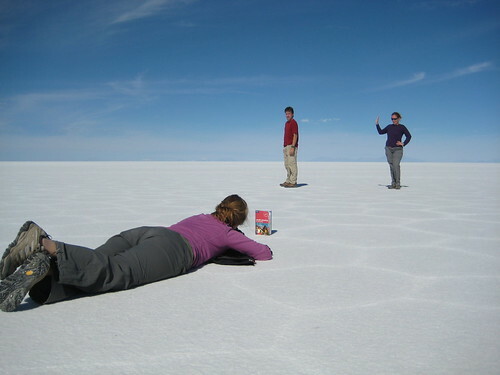 There are loads of different ways to organize a trip to Southwest Bolivia and the salt flats. It’s a huge tourist draw, so there are literally dozens of companies clamoring for your dollars, which is all the more reason to be really clear about what you expect from a trip. 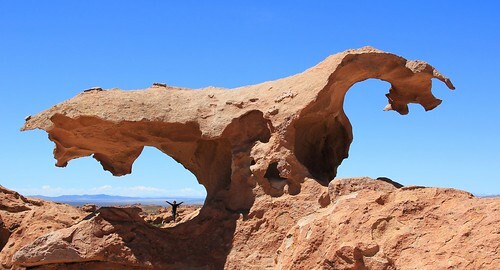 You can do the four-day trip that we did from Tupiza, but you can also go from Uyuni and do it in the opposite direction. We used La Torre Tours and were really happy with them. Tupiza Tours is another company we looked at that gets good reviews from travelers. With our group of 5 we paid about $150 per person for the whole trip, excluding the park entry fees and tips for the driver and cook. Our driver was excellent, and though he spoke no English, he made a serious effort to communicate with basic Spanish and to speak slowly for us. We were able to understand him most of the time and if you have a basic level of Spanish you should be fine. 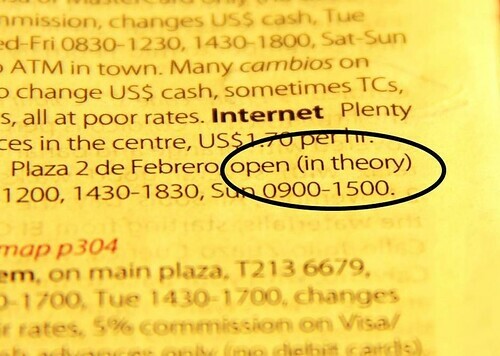 If not, you can pay more for an English-speaking guide. Our cook was very sweet, and the meals were basic, but plentiful. If you arrive on your own, you can either meet up with other travelers and form a group, or shop around and get a space in a partially filled jeep. Tours leaving from Tupiza usually have 4 people per jeep, while those leaving from Uyuni tend to cram 6 people in. 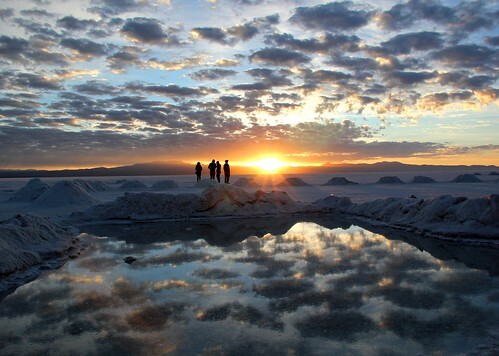 If you can’t, or aren’t interested in a 4-day tour, you can go for shorter routes from either Tupiza or Uyuni. 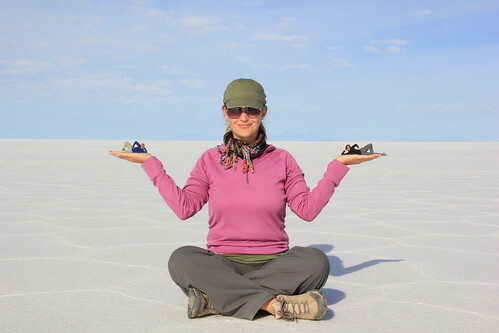 If you are really short on time, just head into Uyuni and sign up for a one day tour of the salt flats, it should be cheap, and totally worth it. Cities/towns visited – Tupiza, Uyuini, Potosi, La Paz, Coroico, Copacabana, Isla del Sol and various little settlements in the southwestern part during our jeep tour. Combi/collective/taxi journeys – 3 plus a 4 day jeep tour. Average lodging cost per night, per person – $8 – We were able to spend most nights in private rooms with private bathrooms. Most expensive lodging – Both places we stayed in La Paz (Hotel Avenida, and the Adventure Brew B&B) were about $11.40 per person for a private room with private bathroom. Adventure Brew was a much better deal as they had consistent wi-fi, pancakes for breakfast, and a free beer every night. Least expensive lodging – $3.50 per person in a nameless hostel in Coroico. We had a 3 person room with a shared bathroom. Average food/drink cost per day, per person – $12.35 We ate out for every meal, and drank like fish. 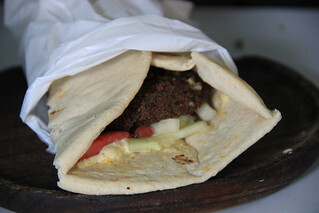 We had a mix of street food and restaurant meals, as well as a healthy amount of snacks… usually in the form of pastry. Hostel – Adventure Brew B&B in La Paz. There are two Adventure Brews, almost right next door to each other. We stayed in the B & B because it was more chilled out than the actual hostel. We had a private room/bathroom for $11.40 per person including a pancake breakfast (REAL pancakes!) and a free beer for each person every night. 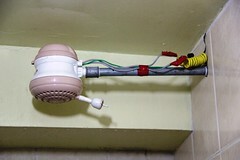 They had the most consistent internet of anywhere we stayed in Bolivia. 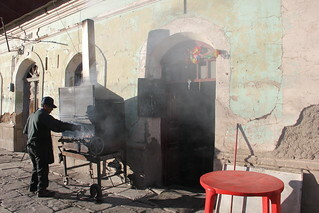 Food – The food in Bolivia gets a bad rap, but truth be told, we ate pretty well there. Perhaps it’s that we went in with very low expectations. Maybe it’s just that the value is just so great. It could be that half of what we ate was pastry, which was delicious. Whatever it is, we have lots to say in the ‘food’ category! Falafel at La Mia Pizza in La Paz – A hole in the wall that serves some pretty good falafel at cheap prices (15 Bolovianos for one huge sandwich). It’s on Calle Illampu near the corner of Santa Cruz. It’s just past a big outdoor/camping shop. Look for the crowd of hippies outside. 4060 in Potosi, Bolivia. Named for the altitude of the city (incidentally, Potosi is the highest city in the world at 4,060 meters, which is 13,320 feet! ), the food at 4060 is definitely one of the better meals we had in our last 6 weeks in South America. 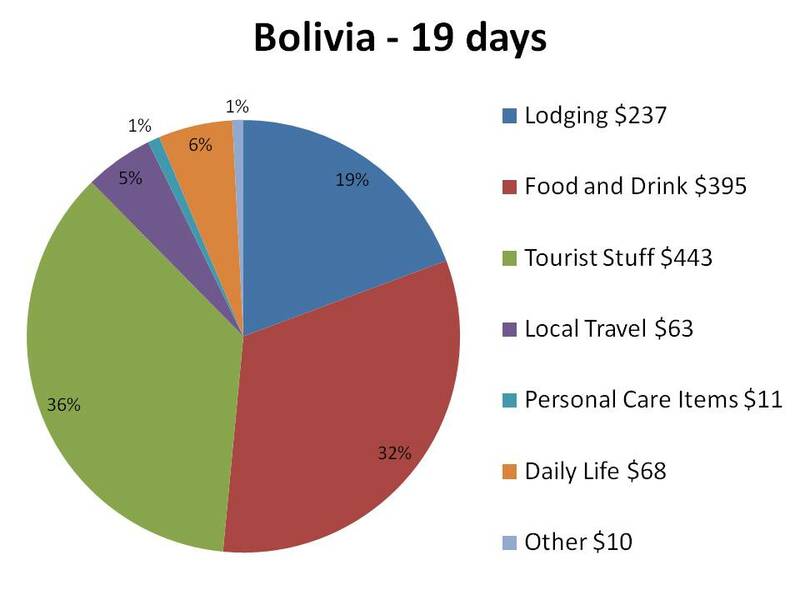 It’s a tad pricey for Bolivia, which means a plate will cost you about $8. They have a big variety of dishes, both local and international, as well as a variety of smoothies and desserts to choose from. It’s just off the main plaza, going uphill on Hoyos. This massive heap of food cost all of about $3! 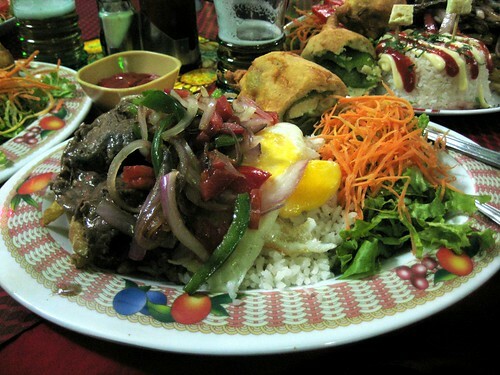 The food here is average for Bolivia, but the portions are gigantic and the prices are dirt cheap. The biggest draw for me was the décor…which was insane. Walking into Alamos was like stepping into another dimension. There are knick-knacks everywhere, most of which are western themed. A huge steer skull with glowing green lights in the eye sockets stares down at patrons from the top of a wall that is plastered with publicity photos of celebrities, photos of tourists sitting in the booths, old movie posters, random license plates, and all kinds of other junk. 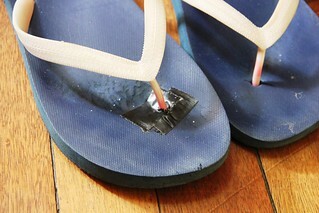 It’s incredibly entertaining. Huge meals with liter beers will set you back about $5. When you find this guy, you’ve found the best chicken dinner in Bolivia. 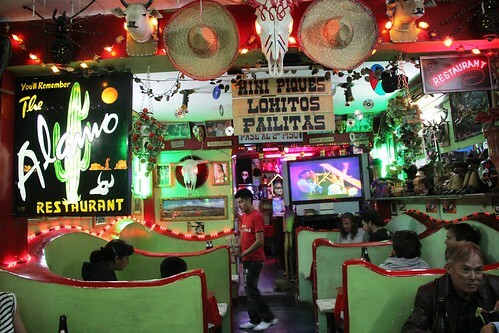 Chicken place in Uyuni – Uyuni is a shithole. Sorry, but it is. The most redeeming thing about the place (other than the salt flats) was the fantastic chicken dinner we had for…wait for it…about $2. We had huge plates of the standard rice and french fries with 1/4 of a chicken. It was some of the best chicken I’ve had, ever. It’s roasted on a spit right outside the restaurant, and is perfectly cooked. Go to the corner of Potosi and Bolivar. Head down Bolivar going away from downtown until you see the guy in the picture. There’s no name. We were the only gringos in the place, and some of us (gentlemen, I’m looking at you here…) had more than one plate. Carla’s Garden Pub in Coroico – Just off the main square, towards the bus station, there are stairs leading downhill from town. If you go down them you’ll run into Carla’s Garden Pub, a lovely place to while away an afternoon. There are snacks, cheap drinks, hammocks, a cat, and wifi! It feels more like Thailand than Bolivia and we spent a few afternoons drinking Tequila Sunrises as we watched the sun set over the hills. 4-Day jeep tour to the Salt Flats – I will write an entire post about this at some point. 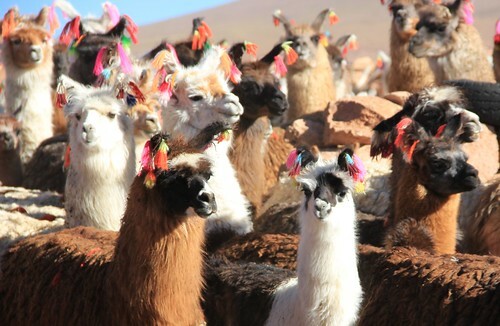 We took a tour of south-west Bolivia through La Torre Tours, and started from Tupiza. We saw some crazy landscapes, culminating in the huge salt flats outside of Uyuni. If you have the time, it’s a great trip. If you don’t, get yourself to Uyuni and just do a one-day of the flats, it’s totally worth it. 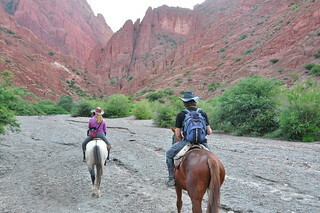 Horseback riding – You can’t ride horses for this cheap anywhere else in South America. We went on a 4 hour ride outside of Tupiza, near where Butch Cassidy and the Sundance Kid met their demise. Incidentally, make sure you check around and find a place that will give you helmets…our ridiculous cowboy hats would not have done us much good had we suffered a fall. The worst is really a relative term in this case. There were plenty of completely mediocre, and some downright awful, places we encountered…but…it’s Bolivia and that’s just how it goes. There wasn’t anything in particular here that we could really single out as being more terrible than was tolerable for the situation. Except maybe the freezing cold showers. 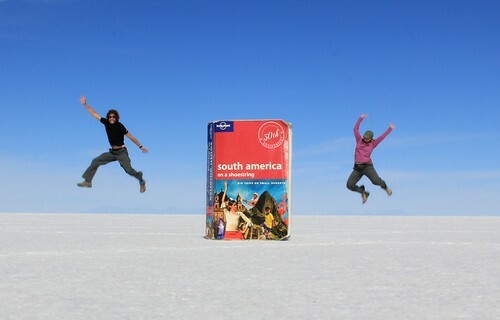 Especially the one in Uyuni.